Volumetric assessment of the liver regularly yields discrepant results between pre- and intraoperatively determined volumes. Nevertheless, the main factor responsible for this discrepancy remains still unclear. The aim of this study was to systematically determine the difference between in vivo CT-volumetry and ex vivo volumetry in a pig animal model. Eleven pigs were studied. Liver density assessment, CT-volumetry and water displacement volumetry was performed after surgical removal of the complete liver. Known possible errors of volume determination like resection or segmentation borders were eliminated in this model. Regression analysis was performed and differences between CT-volumetry and water displacement determined. Median liver density was 1.07 g/ml. 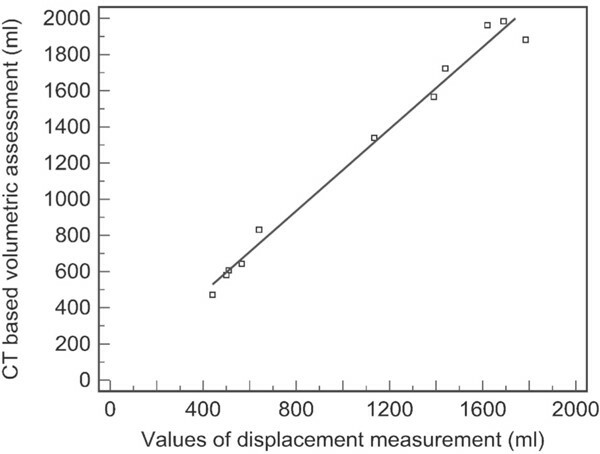 Regression analysis showed a high correlation of r2 = 0.985 between CT-volumetry and water displacement. CTvolumetry was found to be 13% higher than water displacement volumetry (p < 0.0001). In this study the only relevant factor leading to the difference between in vivo CT-volumetry and ex vivo water displacement volumetry seems to be blood perfusion of the liver. The systematic difference of 13 percent has to be taken in account when dealing with those measures. 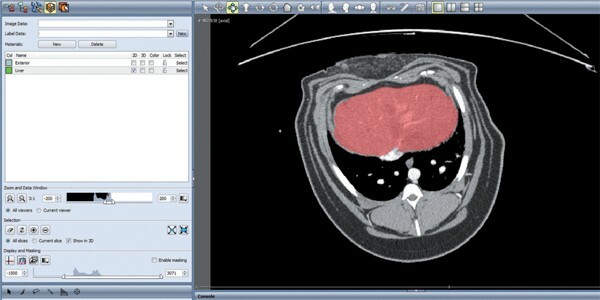 Volumetric analysis of the liver using computed tomography (CT) datasets has become an important component of the preoperative assessment before major hepatectomy and for living related liver donation [1–4]. CT images allow determination of the volume of liver tissue required by the recipient and the volume remaining with the donor. In patients scheduled for major hepatectomy because of malignant tumor, a volumetric analysis is performed to evaluate liver segments and tumor extent and to identify the future liver remnant volume as a supplement to functional assessment [5–8]. Water displacement based on the principle of Archimedes is the gold standard for volume determination: The tissue is immersed in a container filled to the brim with isotonic fluid. The replaced fluid can be easily measured and represents the tissue volume. However, the organ has to be measured in an unperfused state which might influence the results significantly. Thus, noticeable differences remain between radiologically determined CT-volumes and the volumes measured by displacement [9–13]. Various factors that influence liver volume measurements have been discussed. Some approaches take into account the method of image segmentation [14–16] and the difference in perfusion pressure between the time of the CT scan and the intraoperative measurement. While normal vascular perfusion pressure is present during the CT scan, ex vivo there is no more perfusion pressure and blood loss occurs after resection of tissue. When resection is performed for living donor liver transplantation, the tissue will be perfused with preservation fluid to bridge the time to the transplant procedure. These circumstances result in an artificial ex vivo situation that additionally impairs comparison with the in vivo situation. The aim of this study was to systematically determine the difference between in vivo CT-volumetry and ex vivo volumetry by water displacement in a pig animal model. The study protocol was approved by the University Animal Care Committee and the federal authorities for animal research. The protocol complies with the National Institutes of Health guidelines for use of laboratory animals. The surgical procedures were performed at the Department of Experimental Medicine (certified by ISO 9001). The principles of laboratory animal care laid down in the guidelines of the European societies of laboratory animal sciences were followed. The animals of this study were taken from another study setting which focused on biomaterials in connective tissue. The animals needed to be sacrificed for post-mortem tissue analysis. This setting did not influence liver volume analysis. 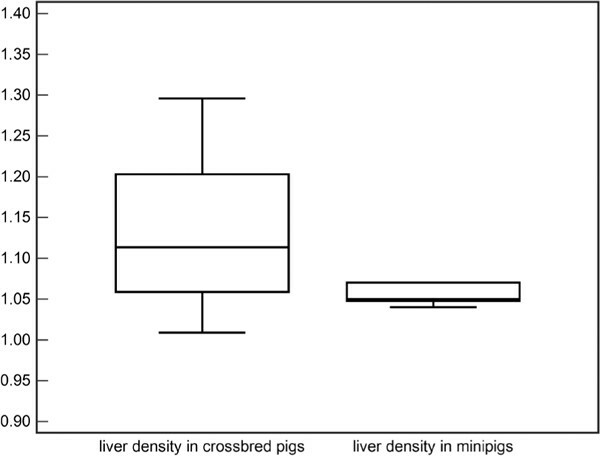 Eleven pigs of different size (six female crossbred pigs, German Landrace X Large White, median body-weight 17 kg and five female minipigs, median body-weight 5.3 kg) were used in the study, as the resulting differences in liver size reflect the whole clinical range. Anesthesia was performed according to the following intravenous anesthesia regimen for CT scans: i.m. injection of azaperone (3 mg/kg "STRESSNIL"®, Janssen-Cilag, Neuss, Germany), ketamine (27 mg.kg-1 "URSOTAMIN"®, Serumwerk, Bernberg, Germany), xylazine (3 mg.kg-1 "ROMPUN"®, Bayer Vital GmbH, Leverkusen, Germany), and atropine sulfate (0.03 mg.kg-1 "ATROPIN SULFAT"®, B. Braun, Melsungen, Germany). After CT scans, deep sedation anesthesia was induced with thiopentone (25 mg. kg-1.h-1 "TRAPANAL"®, ALTANA Pharma, Konstanz Germany), and animals were sacrificed by administration of potassium chloride before starting the surgical procedure for liver resection done by a surgeon with ten years of experience. After the hepatoduodenal ligament and the inferior vena cava were sealed with vascular clamps, the liver was immediately removed. To achieve conditions comparable to human proceedings, the clamps were removed afterwards to let the blood pour out. The liver was not perfused with preserving fluid as it was immediately evaluated and discarded afterwards. Liver weight was measured. For displacement measurement of the liver volume, the tissue was immersed in a measuring tube with a glass tube for overflow in the middle on the side of the container which was filled to this opening with isotonic fluid. All fluid displaced by the tissue poured into a second measuring tube with a scale for directly reading off the result. The CT scans were performed on a 64-channel multi-slice scanner (LightSpeed 64®; GE Medical Systems, Milwaukee, IL, USA). The pigs were scanned in prone position. The scan protocol used in the animals was comparable to regular human liver examinations which comprise multiphase contrast-enhanced scans in a hepatic arterial, portal venous and hepatic venous phase with automatic intravenous injection of 80 ml nonionic iodinated contrast medium (370 mg/ml iodine) in each pig. Contrast was not adjusted to body weight to ensure homogenous liver enhancement. The scan parameters were standardized (voltage of 120 kV and a median of 490 mA (99-499mA) with automatic mA optimization at a noise index of 15; collimated slice thickness: 64 × 0.625 mm; total detector width: 55 mm; rotation speed: 0.4 s; table feed per rotation: 55 mm), resulting in a scan speed of approximately 3 s for 30-cm scan length in the z-axis. For volumetric assessment 1.25 mm images were reconstructed without overlap and evaluated. Basic image analysis was performed using Advantage Windows 4.2 (GE Medical Systems, Milwaukee, IL, USA). CT-based liver volume analysis was performed using the same settings as for pretransplant volumetry in humans (done by two experienced radiologist). Volumes were determined from hepatic venous phase images which best depicted the hepatic veins . These images were transferred to a PC with AMIRA software (Mercury Computer Systems, Chelmsford, Massachusetts, USA), which has been approved for volumetric analysis in several studies [12, 18], and analyzed. For segmentation a blow tool was used that allowed semiautomatic assignment based on continuous homogenous grayscale analysis. A sudden grayscale change automatically stopped contour depiction (Figure 1). Manual correction was possible on any layer. As in liver volume analysis in humans the extrahepatic vessels were excluded. Once all layers were segmented the software calculated the tissue volume from the slice thickness and the segmented area. Method of segmentation on an AMIRA desktop. Contour depiction with the help of a blow tool (arrow). Mouse movement enlarges the segmented area semiautomatically. The CT-based volume measurements were compared to the intraoperative results. A regression analysis was performed to obtain a mathematical term for prediction of future results. Additionally, liver density and differences between all measurements were analyzed. Statistical analysis was performed using the MedCalc software (MedCalc Software, Mariakerke, Belgium). Regression analysis was based on a linear function, y = ax+b, described by Cornbleet et al. . The regression term and the confidence interval were calculated using the jackknife method . Variance analysis used the sum of square deviations of the median value divided by n-1 of all observations (one degree of freedom, DF). Liver densities were compared using the t-test for independent values. The results of all investigated pigs are shown in Table 1. The median liver weight was 1710 g (1471-2027 with a standard deviation, SD, of 196) for the crossbred pigs and 534 g (463-687, SD 86) for the minipigs. Median liver density was 1.07 g/ml. The comparison between both groups of pigs is shown in Figure 2. As the densities do not differ significantly, a general liver density of 1.07 g/ml is assumed for the study. Regression analysis for all 11 pigs resulted in the following term (y = CT volumetry, x = displacement): y = 1.13 x + 30.91 ml (Figure 3). The coefficient of determination, r2, for this term was 0.985. Thus, liver volumes determined from CT are 13 percent higher than the volumes measured by water displacement volumetry. The difference of axis intercept of 30.91 ml is negligible and not significant whereas statistical significance on the slope with p < 0.0001 was shown (Table 2). Weight, volume and density of liver in 11 pigs. 1 to 6 are crossbred pigs, 7- 11 are minipigs. Liver densities in g/ml as box-and-whisker plots. The central box represents the values from the lower to upper quartile (25 to 75 percentile). The middle line represents the median. The horizontal line extends from the minimum to the maximum value. Regression analysis confirming the term y = 1.13 x + 30.91 ml. Regression analysis with statistical values. CT volume datasets are widely used for quantitative volume analysis in humans [21–23]. Nevertheless, there are significant differences between volumes determined by CT and volumes measured by water displacement, especially when determining liver volumes. Studies performed in humans measuring volume report differences of 30% , 18%+361 ml , 13%  and 2% . Reports on the influence of the segmentation method [14, 15, 23, 27–29] showed (semi-) automatic segmentation methods to be superior to manual segmentation with less interobserver variance. Bolte et al. reported an error of 0.01% for a surface segmentation method . We expect the error to be negligible as the tissue surface to tissue volume ratio is much lower in large tissues than in small volumes. In addition, the study of Napoli et al. showed single measurements to be adequate compared to multiple measurements of single datasets . Another important point might be the breathing excursions of the animals. This could have been minimized by intubation and breath-hold scans, although the similar error size in breath-holding patients and the breathing pigs argues that this factor is probably of limited significance. Generally, breathing artifacts occur in human imaging studies as well, although liver CT is usually performed during breath-hold. The only means to reduce breathing artifacts in animals is to shorten acquisition time by performing CT scanning on a high speed multidetector CT scanner as used in our study. Still, breathing artifacts were present in some of the pigs. Thus, at present CT volumetry itself is a valid method without significant differences when performed with state of the art methods. Overestimation of volumes using CT datasets was also found by Frericks et al. showing a constant overestimation when measuring volumes larger than 500 ml by CT . However, the liver perfusion was artificially reached by an ex vivo technique leading to a non-physiologic situation, which is not comparable to the procedure used in the clinical situation like in living donor liver transplantation [31, 32]. Comparing the difference of in vivo CT-volumetry and ex vivo water displacement volumetry (or graft weight) used in our study aimed exactly the clinical procedure. Thus, the results may be directly used in clinical practice. To ensure that the results of our experimental study can be transferred to the human situation, the liver tissues have to be comparable. Pigs are often used as experimental animals because their tissues are said to be comparable to human tissue. At first, the vasculature is very similar in porcine models and humans which might justify applying a similar correction term to humans. Also, porcine and human livers have very similar morphological as well as biochemical properties [33, 34]. We selected tissue density as an alternative criterion to ensure comparability. We found a mean density of 1.07 g/ml tissue in two types of pigs, which is similar to the range of 1.02 and 1.09 reported for healthy human liver tissue . Based on these results, we do not expect relevant differences between our experimental results and the application in humans. As limitation in this study it has to be considered all evaluated liver tissue was healthy, no cirrhotic changes were seen in this model. We investigated two types of pigs with different liver sizes. This was done to evaluate a certain range of variation and make the experimental setting more comparable to the human situation including all sizes of liver tissue. The pigs in our experiment were scanned with physiological perfusion pressure in all vessels and regular hepatic perfusion. Similarly to the clinical procedure after removing the liver the clamps on the hepatic vessels were removed allowing blood pour out. The latter resulted in a loss of vascular pressure and intravascular fluid, which seems to be the main reason for the difference between in vivo CT-based volume calculations and in vitro displacement measurements. This is comparable to the procedure in human liver transplantation, where additionally the large vessels are initially flushed with preserving fluid. Afterwards the vessels are not ligated and fluid can pour out, as in our study. In an experimental setting Frericks et al. achieved a vascular pressure of 4 mm H2O with the use of a balloon catheter . However, this nonphysiologic condition forces hemocongestion which probably result in a higher volume loss than under physiological conditions. In a study of 25 candidates for living related liver donation Hiroshige et al. compared resection tissue volumes determined with CT and displacement . Although the difference of 13 percent identified by these investigators is comparable to our study, Hiroshige et al. attribute the discrepancy to the fact that the resection lines assumed for CT volumetry and the actual resection lines were not the same. Since we only evaluated results obtained from the entire porcine liver, actual resection lines could not influence our results. Hence, this factor can be excluded as explanation for the observed difference by our data. Moreover, the design of the present study could clearly show that the only factor leading to the difference between in vivo CT-volumetry and ex vivo water displacement volumetry seems to be the blood perfusion of the liver. All other relevant factors were not applicable in this setting, since the only intervention was the removal of the liver. Thus, the systematic difference between CT-volumetry and intraoperative water displacement volumetry of 13 percent has to be taken in account when dealing with those measures. The only relevant factor leading to the difference between in vivo CT-volumetry and ex vivo water displacement volumetry seems to be blood perfusion of the liver. The systematic difference of 13 percent should be taken in account when dealing with those measures.